When all else fails, just write. – Trees & Flowers & Birds! When all else fails, just write. Having no specific topic or opinion on my mind that wont offend a ton of people right now, I shall resort to the mundane – what I did on my summer vacation. I don’t get summer vacations. Fine then – here’s what I’ve done pretty much since July, how’s that? Work (day job at it’s most intense since the auditors arrive for year end fun this coming Monday), study (gearing up for the launching of a full on consulting business within the next 60-90 days), cook, drive, clean, nag the teen to study, run, drive, work, study, cook, run, go the racetrack, work, read, watch the Olympics, drive, go to Chargers training camp, work, study, cook, drive, clean, clean up yard for new fence installation, clean out kitchen cabinets and re-arrange counter tops, scratch a cat or two, work, run, drive, cook, clean, nag the teen etc etc. OK, so there’s one or two fun things in there. Chargers training camp was an outing for 15 and I to get ourselves amped up for fantasy football. Oh, and to get him ready for his own set of practices which start in earnest tomorrow. The dreaded August 2-a days in the heat of the summer. Weee!!! And while the kitchen cabinet clean out may not sound like FUN – it resulted in a kitchen that makes me feel calm and that I have kept clean and uncluttered for 10 straight days now. I also have to admit that while I was worried that the new taller fence would make the yard look really small, since I did have to strip out all the jasmine (waaah, maybe some will grow back? ), it actually gives the yard more usable space along with the additional privacy. So there you go. While the day job might ease up a bit starting next week, the other stuff will just fill it in. 15 will turn 16…football starts as I mentioned and then school starts back up in just 3 weeks. The first semester of online math is done (solid B) and the second one is started and needs to be completed this month as well. I predict a few more nagging sessions before it all ends! I will be relieved when it does end. I *think* the right amount of motivation has been dangled before him to at least get us through the hardest part of school – he needs a 3.5 at the end of October review period to get his driver’s license and if he KEEPS the 3.5 into December, I have promised him a new laptop (his old one is from the end of 7th grade & is a clunker). Since the 1st semester includes football, it is usually the one that he has the most trouble staying focused. Here’s hoping that between it being a big year for college transcripts, and the additional carrots dangled, that the motivation stays higher this time around. 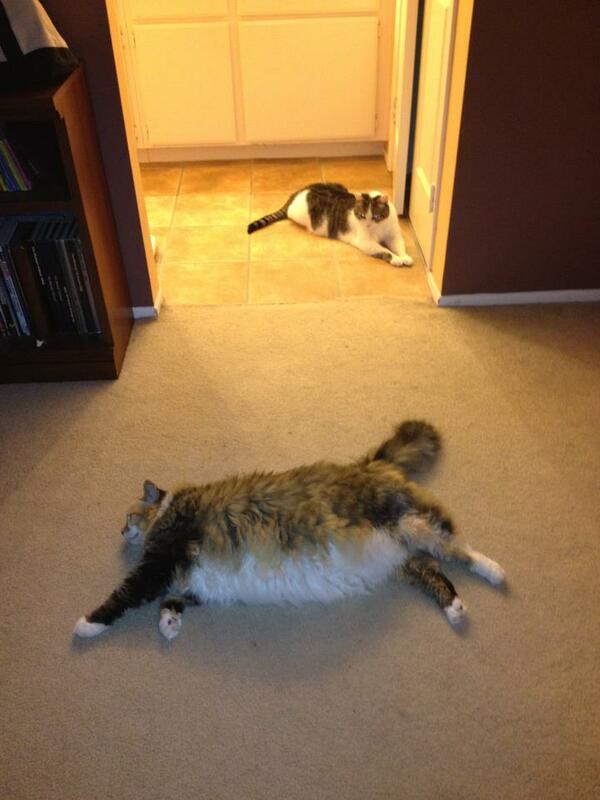 I’ll leave you with the in home version of the Olympics at my house – The Cat Hurdles. You must transition from the bedroom to the bathroom sink without disturbing the felines – GO! US Olympic Team Fashion – or not! My cat makes the cat hurdles more difficult. She lounges across the floor and when I try to step over her, she jumps and scatters right where my next step will be. I can’t tell you how many twisted ankles and near falls I’ve gotten this way! Sixteen is a big year. Good luck to him and to YOU! I think the dangling carrots will work. He can do it!